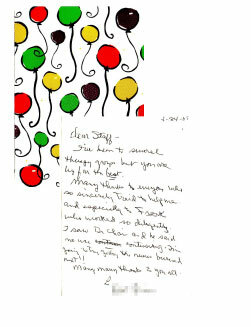 We enjoy the letters we receive from our patients. 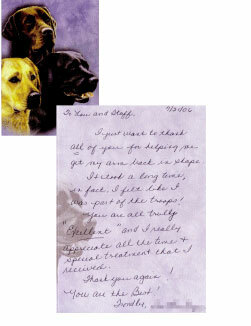 "A little note with a Great Big Thank You! 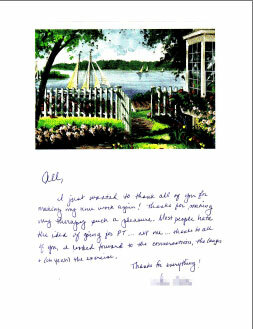 To all the Excellent Physical Therapists who took care of me: Lou, John, Frank & Kevin.... Thank you so very much for helping get to where I am today. You're the best! Will miss you!... To all the Excellent Staff. 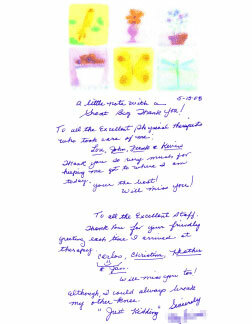 Thank you for your friendly greeting each time I arrived at therapy: Carlos, Christina, Heather & Jan. Will miss you too! Although I could always break my other knee..."Just kidding"
I just wanted to thank all of you for making my knee work again! Thanks for making my therapy such a pleasure. Most people hate to idea of going for PT...not me...thanks to all of you, I looked forward to the conversations, the laughs and (oh yeah) the exercise. I just want to thank all of you for helping me get my arm back in shape. It took a long time, in fact, I felt like I was part of the troops! 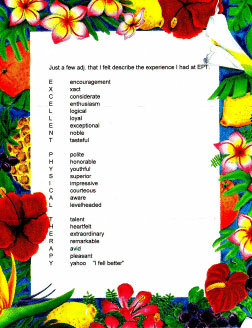 You are truly "Excellent" and I really appreciate all the time and special treatment that I received. Thank you again! You are the best! I want to express my thanks to your for your good treatment. I am optimisitic that I will remain pain free and I'm not lifting heavy weights any longer! I hope you and your family have a happy and peaceful Christmas and New Year. Thanks! Thank you all so much for your excellent care. I am feeling so much better now than when I started my PT. 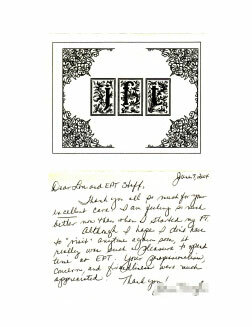 Although I hope I don't have to "visit" anytime again soon, it really was such a pleasure to spend time at EPT. Your professionalism, concern and friendliness were much appreciated. 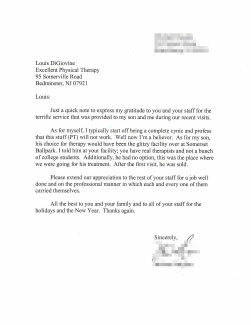 Just a quick note to express my gratitude to you and your staff for the terrific service that was provided to my son and me during recent visits. As for myself, I typically start off being a complete cynic and profess that this stuff (PT) will not work. Well now I am a believer. As for my son, his choice for therapy would have been the glitzy facility over at Somerset Ballpark. I told him at your facility you have real therapists and not a bunch of college students. Additionally, he had no option, this was the place where we were going for treatment. After the first visit, he was sold. Please extend our appreciation to the rest of your staff for a job well done and the professional manner in which each and every one of them carried themselves. 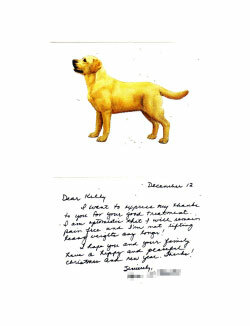 All the best to you and your family and to all of your staff for the holidays and the New Year. "Just a few adj. that I felt describe the experience I had at EPT. Y yahoo "I feel better""